Investigate a murder in Markarth to discover a sinister plot surrounding the Forsworn. Meet with Eltrys in the Shrine of Talos after receiving his note. (Optional) Talk with Eltrys in the Shrine of Talos to get your reward. Find out who "N" is. 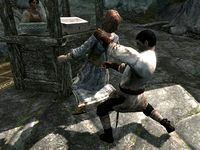 While walking through the open market in Markarth, a woman named Margret is viciously attacked while buying jewelry. Her attacker, a Breton witchblade named Weylin, will shout a rallying: "The Reach belongs to the Forsworn!" as he attempts to escape. If you do not step in, the guards will kill Weylin, who defiantly exclaims, "I die for my people." In the ensuing confusion, the guards are curt as they try to quell the small crowd that has gathered. If you ask about the crime and the Forsworn, they tell you that the Forsworn are nothing but a bunch of madmen, and to mind your own business. Shortly after the scene in the marketplace, a Breton citizen named Eltrys will approach you and ask if you saw what happened. You can chat with him for a bit about the assault, but then he will suddenly say, "Oh, I think you dropped this. Some kind of note. Looks important." If you question him about the note, he feigns innocence. The note tells you to meet him at the Shrine of Talos. You can ask him how to find the shrine, and while he is still elusive, he will say: "Huh. Not sure. I don't worship Talos, myself. I think I heard someone mention it was underneath the Temple of Dibella, in the big crag in the center of the city." Travel to the shrine underneath the Temple of Dibella. To get there, climb the stairs at the north corner of the marketplace, follow the bridge to the left, then take the path to the left and you should see the door. Descend into the temple and speak to Eltrys, who has been looking for answers about the Forsworn attacks that have been happening in the city, and why the guards do nothing about it. He pleads for your help; find out why Weylin attacked Margret and who is behind all of this. He will pay you for any information you can bring. To find information on Margret, go to the Silver-Blood Inn and ask Kleppr or Frabbi about her. She apparently rented the nicest room in the inn, which is down the hall to the left of the entrance. If you did not obtain the key to Margret's room from her corpse earlier, you can receive it through dialogue with Kleppr, steal it from behind the bar (or even just simply take it freely), or just pick the lock to her door. Searching the end table in her room will yield Margret's journal. After reading her journal, you learn that she probably wasn't just a casual jewelry shopper, and that she has been gathering information about Thonar Silver-Blood. If Margret is alive, she will be sitting by the fire at the inn or standing out in the marketplace. You can persuade her to divulge her real purpose in Markarth. Apparently, Margret is an Imperial spy working with General Tullius to investigate the Treasury House and the Silver-Blood family. She was hoping to procure the deed to Cidhna Mine for the Imperials. She is also sure that Thonar Silver-Blood arranged for her murder. After leaving the inn with your information about Margret, a Markarth City guard will try to warn you off your investigations. You can report back to Eltrys with your information about Margret for a leveled gold reward, or continue researching Weylin and Thonar before going back to Eltrys. In your investigations thus far, you have learned that Weylin worked as a smelter at Cidhna Mine and lived in the Warrens—a public house for the city's destitute. You can follow the smelter lead to the Smelter Overseer's House to speak with Mulush gro-Shugurz. However, he is reluctant to talk to you, giving you a Speech challenge, which actually results in very little information. You will find out that you need to go to the Warrens and speak with Garvey. A more direct route will be to speak with Garvey, a resident of the Warrens and the keeper of the keys. Ask him about Weylin and tell him you need the key to Weylin's room. He will only give you the key if you pass a Speech challenge to persuade, intimidate, or bribe him. It's important. Trust me. (Persuade) Passed: Trust is hard to come by here, but all right. How about now? (Bribe) Passed: Welcome to the Warrens. I wasn't asking. (Intimidate) Passed: Now don't get all upset. Here. Take it. If you do not receive the key, you can pick the lock on the door or pickpocket the key from Garvey. Weylin's room is to the rear of the Warrens, on the right-hand side. Enter it and look in the chest for a note addressed to Weylin. Read the note to learn that Weylin truly was not acting alone, and that some anonymous puppet-master named only "N" was directing Weylin's actions. You will now gain the objective "Find out who N is". When you exit the Warrens, a Breton named Dryston will approach you, threatening: "You've been digging around where you don't belong. It's time you learned a lesson." You have some dialogue options, but it will come down to Dryston taking a swing at you and a brawl ensuing. If you attack Dryston with anything but your fists (i.e., weapons or magic), you will receive a bounty and any guards that witness the fight will attack you. Once you defeat Dryston, he will tell you, "I was sent by Nepos the Nose. The old man hands out the orders. He told me to make sure you didn't get in the way. That's all I know, I swear!" This is all Dryston knows, and any attempts at further questions will just be answered with, "Nepos is in charge. That's all I know." Dryston also carries a note confirming it was Nepos that directed him to "rough you up". You are now directed to find out about Nepos the Nose. You can report back to Eltrys with what you have discovered about Nepos for a leveled gold reward. Eltrys will be quite surprised that Nepos may be involved, but concedes that he may be getting orders from elsewhere. From here, continue on with your investigation into Thonar. Following Eltrys' suspicions that Thonar and the Treasury House are involved in this conspiracy should be your next stop. When you enter the venerable financial institution, Rhiada will be at the front desk. You can ask to see Thonar, which prompts a Speech challenge, or you can just pick the lock on the door to the left of the front desk, bypassing Rhiada altogether. When you enter Thonar's room he doesn't seem alarmed to see you and you may speak to him about Margret, the Forsworn, or the guards that are harassing you. Suddenly, there is a disturbance—Thonar will call out to his wife, Betrid, who has fallen victim to Nana Ildene and Donnel, the supposed cleaning crew for the Treasury House. Kill Nana Ildene and Donnel, and then express your sympathies to Thonar. He will curse the Forsworn, and then tell you that he has been controlling them by imprisoning their king Madanach. Madanach has now become "out of control", however. The attack on Betrid can be avoided by pickpocketing Thonar's journal without speaking to him. When you enter Nepos's house his housekeeper, Uaile, will step in to keep you from seeing Nepos. However, she is overruled by Nepos, and he invites you in for a chat. Your dialogue choices all end with Nepos admitting that he is indeed Forsworn. When questioned further he will reveal a strong loyalty to "the King in Rags", Madanach, from whom he gets his orders. He will give you some history on Madanach's position and political views. Nepos is actually quite verbose in the matter of Madanach, which should by now be making you suspicious. As suspected, Nepos will then inform you that Uaile is actually a Forsworn agent and you won't be getting out of the house alive. Everyone in the household draws their weapons, including Nepos. After the battle, you can find Nepos' journal where he pours out his remorse for his actions. You can also try to pickpocket Nepos's journal to gather the evidence secretly and avoid the fight. Lingering too long after the theft here will result in everyone becoming hostile. It's off to Cidhna Mine for you. Return to the shrine of Talos to report back your findings. However, when you arrive Eltrys has been slain by a group of guards, who are now lying in wait for you. "We warned you, but you just had to go and cause trouble. Now we have to pin all these recent murders on you. Silence witnesses. Work. Work. Work." Player: "What did you do to Eltrys?" Guard: "Same thing we do with all the other natives who want to change things around here. We had a nice little deal going between Thonar and Madanach until you and Eltrys started snooping around. Well, you wanted to find the man responsible for those killings? You'll have plenty of time with the King in Rags when you're in Cidhna mine [sic]." Player: "You're corrupt. Thonar is paying you." Guard: "We have a nice arrangement in this city, and we're not letting you get in the way. You have a problem with that? Take it up with Madanach. I'm sure the King in rags and his Forsworn would love to meet you. Now you're coming with us. It's a life sentence in Cidhna Mine for you." Player: "Madanach is behind these killings!" Guard: "You think you're the only one who knows that? We had a nice little deal going between Thonar and Madanach until you showed up. You'll have plenty of time to take it up with the King in Rags while you're serving a life sentence in Cidhna Mine." If you resist arrest, several waves of guards will attack you within the shrine. 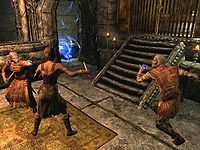 If you end this combat (either by killing all guards or otherwise), any Markarth City Guard who sees you afterward will attempt to arrest you on sight for "murder and conspiracy against the city of Markarth". When you are arrested with this dialogue, you may be presented with several normally-available choices for escaping arrest (i.e. Thane status, Thieves Guild, bribery), but any choice other than going to jail or resisting arrest is rendered useless. The guards will reject any and all attempts to exonerate the Dragonborn whatever the player tells them. They will then attempt to apprehend the Dragonborn on sight. This is a gameplay script exclusive to this mission. Going to jail will still begin No One Escapes Cidhna Mine. This arrest-on-sight status will persist permanently in Markarth until you submit to going to jail. It is possible to save Margret from Weylin's attack if you act as soon as he pulls his knife. If you attack him, he will become hostile towards you and attack you instead of Margret. Margret will reward you for saving her and you will not get a bounty on your head. This will have an effect on the information gathering stage of the quest. Using the Voice of the Emperor Imperial racial ability to pacify Weylin also works. You can also use the Slow Time shout to give yourself more time to (re)act to the attack and ready an appropriate spell or weapon. It is not necessary to complete all objectives to advance the quest to the final stage. Upon completion of any task after discovering Margret's status as a spy, the final scene will trigger the next time you enter the Shrine of Talos. If you complete the negotiations between the Empire and the Stormcloaks and you choose to give Markarth to the Stormcloaks, you will not be able to complete this quest if you began it but did not meet with Eltrys. Upon entering the Shrine of Talos, you will find Eltrys dead, but the guards will not arrest you for the murder. If you choose to go to jail, you will not be able to gain entrance to the King in Rags' cell to continue the quest. It appears that by handing over Markarth during the negotiations, this quest will automatically end. It is possible to complete this quest without starting No One Escapes Cidhna Mine by stealthily killing the middle guard in the Shrine of Talos when you return there for your final report to Eltrys before you are seen. If you do this, however, you will never be able to start the next quest. If you have completed the quest Silver Lining, you will have the dialogue option to tell the guards you want to clear your bounty for half the cost. However, the guard will tell you he doesn't care who you're with, and your only option will be jail time in Cidhna Mine. If Nana Ildene and Donnel die before you talk to Thonar, Betrid will die without anyone being there to kill her. She will not die if you never talk to Thonar. If you previously pickpocketed Thonar's journal, the quest will jump ahead and you'll find Eltrys dead with three angry guards at the shrine. It is impossible to get your reward after you meet with Nepos or Thonar. Eltrys will be killed after either one of the stage. After you meet both Nepos and Thonar, you will be unable to loot Eltrys's body because it will disappear immediately when you enter the Shrine of Talos and start No One Escapes Cidhna Mine. Eltrys's dead body can be un-vanished and looted using the console with prid 00101001 and enable. It is possible to loot Eltrys's body as an Imperial character by initially refusing to surrender to the guards, looting his corpse, then using the Voice of the Emperor power to calm the guards, and surrendering to them. If you are having trouble starting the next quest No One Escapes Cidhna Mine after this quest is completed and submit to go to jail, with no reason, even if you complete this quest before starting either side of the civil war questline, try this solution. Proceed this quest as normal, and when you are at the end of the quest and you are in the Shrine of Talos' you'll see Markarth guards waiting for you. One of the guards will initiate dialogue with you. You've got three options: go to jail, pay the gold, or refuse to submit. Without closing the dialogue menu, open the console menu and type setstage ms02 10. The next quest will then start with no problem. Another possible solution is to drop or store as many items as possible from your carried inventory. The game may crash or freeze as it tries to save your carried items so that they can be returned at the end of the next quest, so reducing the number of items to be saved will avoid the freeze. If you kill the Markarth guard that warns you once you find evidence about Margret, the center guardsmen will not be at the Shrine of Talos, making it impossible to complete the quest. However, if the city's allegiance (Imperial or Stormcloaks) changes during this part of the quest, it will be completed and the guards will vanish from the game, making it impossible to start No One Escapes From Cidhna Mine. Entering these console commands will cause Weylin to attack her: "Prid 9C8AB", "Setrelationship 9C8A9 -4". From there, the quest should proceed as normal. 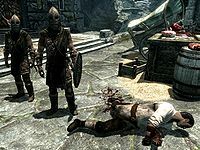 If you then proceed to pickpocket Thonar's journal before entering the Shrine of Talos, you will find Eltrys's dead body and three guards who will arrest you for his murder as well as the other murders around the city (even though no one else has died), thus completing a quest which never started. This also prevents the deaths of Margret, Betrid, Nana, and Donnel. If the incident in the marketplace does not occur, Vigilant Tyranus will not spawn in Markarth, preventing you from starting the House of Horrors quest. If you become a Thane of the Reach before starting or completing this quest, you will not be arrested when you return to the Shrine of Talos, making you unable to complete the quest. Even if you murder a guard and submit to arrest, you still will not be able to complete the quest. Followers may get permanently stuck in the Shrine of Talos, regardless of whether or not the quest is completed and you escaped from Cidhna Mine. If this happens, the follower will not leave even after you tell them to go home, and if they are moved elsewhere via console, they will walk back to the Shrine of Talos, no matter where in Skyrim they are. The easiest way to prevent this bug from triggering is to order your follower(s) to wait outside the Shrine of Talos or to dismiss them immediately before entering to be arrested. If the Markarth guards do not warn you off after having investigated the inn for Eltrys and you get stuck (guards won't arrest you) when returning to him after finding out all you can about the conspiracy, if you wander the streets and do meet the guard who warns you off and then return to the temple, the guards will still arrest you (or attempt to do so). 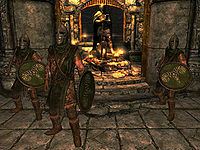 Because the three guards who ambush you in the Shrine of Talos are chosen randomly from the guards in Markarth, it is possible that the commander in the keep, either Legate Emmanuel Admand or Kottir Red-Shoal, may be among them. If they are, neither of them will give dialogue options that allow the completion of the quest, instead preferring to talk about the war. The other guards will not initiate dialogue. This will leave the quest stuck at this stage, since you cannot be framed and sent to prison for Eltrys' murder. If you use the console command setstage ms02 10, then go commit a crime, get yourself arrested, and thrown in jail, the quest will proceed as normal. If you go into the shrine of Talos after having completed the recon and the third guard is absent, and fails to show after waiting, restarting the quest, and other suggested fixes, kill the two guards present then submit to arrest. Serve the jail time, then come back after being released from jail. If you save Margret, but later take her journal, it becomes permanently stuck in your inventory as a quest item. If you obtain Margret's journal before meeting with Eltrys at the Shrine of Talos, the guard that approaches you after reading the journal and exiting the Silver-Blood Inn may be missing all speech audio (subtitles show for a fraction of a second then disappear), even greetings. ? If you give Margret's journal to Eltrys before leaving the Shrine of Talos and immediately after taking the quest, it will be bugged when reentering the temple of Talos to return the clues you found. There will only be two guards and if you talk to the one on the right, he talks as if he is guarding a Dwemer museum and will not initiate any conversation about the murder. ? Even if you prevent Weylin from killing Margret, the journal update will say he killed her. If you pickpocket Nepos's journal and only read it after going outside, the quest will update and tell you to go meet Eltrys, but when you do, only two guards are waiting next to Eltrys's body and won't initiate dialogue. ? This can be fixed by going back to Nepos's house and killing everyone there. If you are wanted in Markarth for a separate reason, you have to deal with the guards first, then leave the Shrine of Talos and come back. ? Dryston may fail to spawn when you have exited the Warrens. ? Type player.placeatme 000D6711 to make him appear. When acquiring Weylin's Note from the chest, taking the note adds 'Read Weylin's Note' to your journal, even if you read the note before taking it. Reading it again doesn't update the journal, but the next quest stage (the brawl) does. 95 Finishes quest Eltrys is dead, and I've been framed for his murder. My only option to clear my name is to let myself be imprisoned inside Cidhna Mine and locate Madanach, the King in Rags. 100 Finishes quest Eltrys is dead, and I've been framed for his murder. My only option to clear my name is to let myself be imprisoned inside Cidhna Mine and locate Madanach, the King in Rags. The following empty quest stages were omitted from the table: 0, 10, 12, 13, 32, 37, 39, 41, 42, 43, 45, 49, 50, 52, 54, 57, 60, 61, 72, 74, 82, 90. On the PC, it is possible to use the console to advance through the quest by entering setstage MS01 stage, where stage is the number of the stage you wish to complete. It is not possible to un-complete (i.e. go back) quest stages, but it is possible to clear all stages of the quest using resetquest MS01. This page was last modified on 27 January 2019, at 17:42.